US, 1948, 110 minutes, Colour. Errol Flynn, Viveca Lindfors, Robert Douglas, Alan Hale, Ann Rutherford, Robert Warwick, Una O' Connor, Aubrey Mather, Raymond Burr. 1. Audience expectations of this character, legend, Errol Flynn in the role and audience expectations of him? 2. What is the value of taking the old '30s Errol Flynn style, the swashbuckling. and putting it in the framework of the Don Juan myth? What kind of film is created, for what audience? 3. What is the continued appeal of costume drama, swashbuckling adventure? Escape, history, comparisons of society etc, heroics? 4. The importance of the sets, costumes, lavish presentation, attention to detail, stirring music etc.? 5. 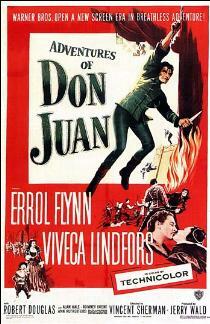 The particular qualities that Errol Flynn brings to such a character, how did he bring them to Don Juan? In action, in love sequences, in his tongue-in-cheek rendition of dialogue? Interpretation of situations? His interpretation of the romantic myth of Don Juan? His dalliance with the ladies, the confrontation with husbands and fiances? The humour and the parody in the initial presentations? 6. The transition to Spanish politics and audience interest in this? Don Juan's nobility and patriotism? Setting the scene for the intrigue, villainy? Heroics? 7. The presentation of the Spanish court: the weak king, the dominance of the foreign queen,, the Duke of Lorca and his control and villainy? How strong were the characterisations here? Is this important? 8. Don Juan, his loyal assistant, the men in the training school (and the women coming to watch)? Don Juan and his loyalty, his declaration of love to the queen and her reaction, his reaction? 9. The Elena incident? The role of Sebastian the dwarf? 10. The presentation of the fighting, the rescue from prison, the swordfights etc.? The final confrontation with Lorca? How excitingly presented? 11. How conventional is this kind of material? How well and excitingly was it presented here? Presuppositions in the audience of right and wrong, good and bad, heroic and noble?